The Rebel Sweetheart. : Sneak Peek | Peripera Pearly Night Collection. Barely eight weeks 'til Christmas! Can you believe how fast time flies? Just a few months ago I was blogging about the spring and summer collections of some of my favorite Korean cosmetics brands, and now here I am, already looking forward to what these brands have to offer for the winter. 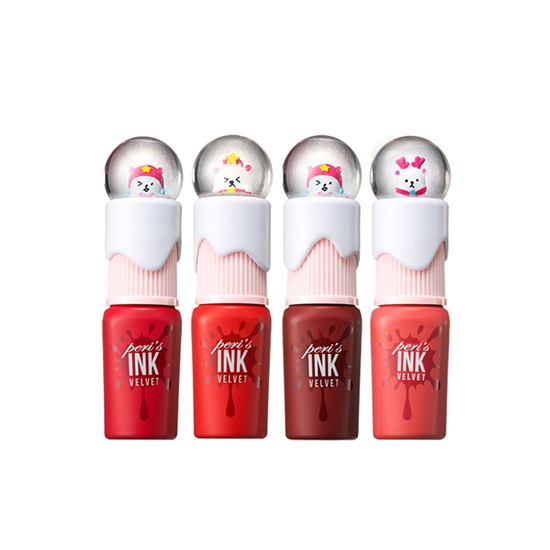 One of the first to launch their holiday collection is Korean beauty brand Peripera, whose previous holiday collections include a collaboration with the Disney movie Frozen and Cartoon Network's lovable little girls, The Powerpuff Girls. 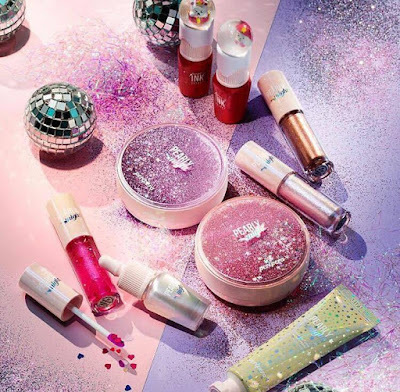 This year, it's all about glam and glitter with the Pearly Night Collection, and the full range of products will make you look forward to Christmas even more. Peripera Pearly Night Collection, as seen on Peripera's official Instagram page. First up are the Ink Highlighters, which come in pearlescent 'ink' bottles. 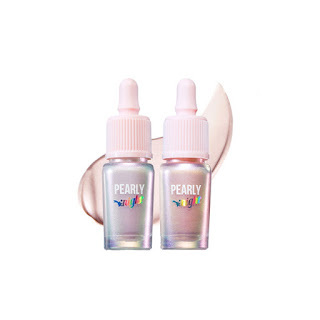 Pearly Night Ink Highlighter, 9000 won. They are available in two shades - Lavender Space Beam and Pink Champagne Beam. Shade reference for Pearly Night Ink Highlighter. There's also a trio of Hand Creams which come in star-spangled tubes. The purple tube is called 'Sweet Bouquet' and has a sweet, floral scent; the yellow tube is 'Vanilla Hug' and has the scent of coffee and vanilla; while the blue tube, named 'Girl's Cotton', has the refreshing scent of - you guessed it right - cotton. Pearly Night Hand Cream, 4000 won. The collection also includes a selection of glittery liquid eyeshadows, perfect for all those evening parties during the Christmas season. 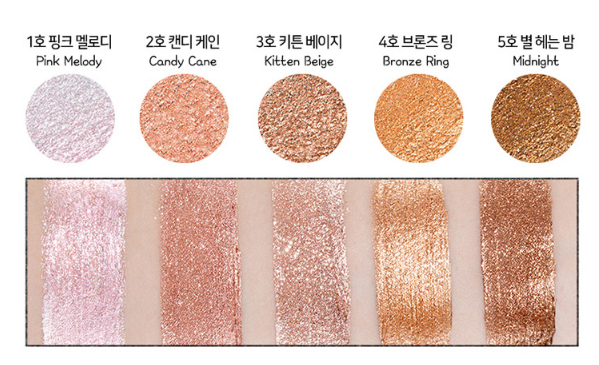 Pearly Night Liquid Glitter Shadow, 10000 won. 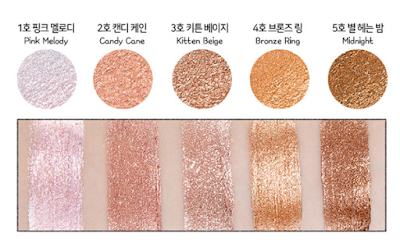 There are six Liquid Glitter Shadow shades to choose from: Pink Melody, Candy Cane, Kitten Beige, Bronze Ring, and Midnight. 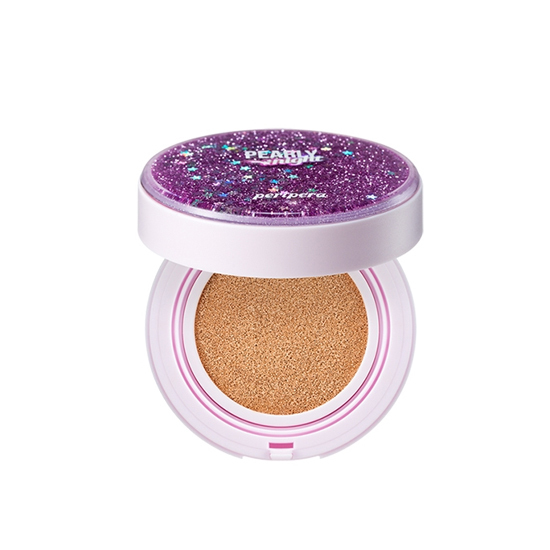 Shade reference for Pearly Night Liquid Glitter Shadow. Of course, no collection would be complete without lip products! 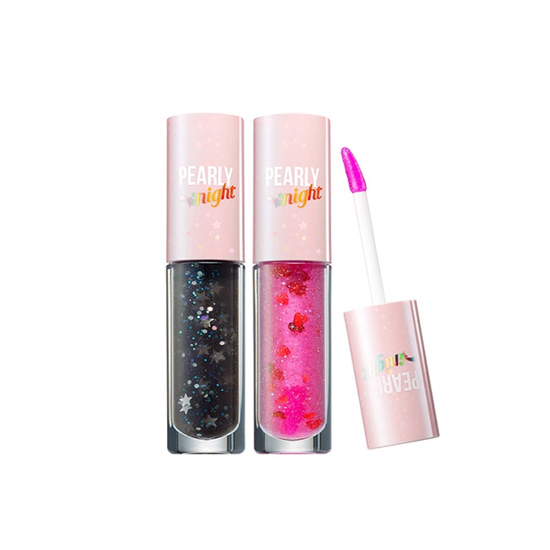 This collection includes two shades of the Lip Glitter - lip glosses with silver stars (Space Trip), pink hearts (Pink Night), and holographic sparkles in each tube. Pearly Night Lip Glitter, 9000 won. I'm not too keen about the sparkles, though. Sure they're cute and all, but they run the risk of being ingested which isn't exactly a good thing. Shade reference for Pearly Night Lip Glitter. The Ink Velvets, however, are a totally different story. They're irresistibly cute from the get-go, and for someone who collects snow globes, I swear, I'd buy them all for the packaging alone. Haha! Pearly Night Ink Velvet, 11000 won. There are four shades included in this collection - Sellout Red, So Grapefruit, Celeb Deep Rose, and Beauty Peak Rose. 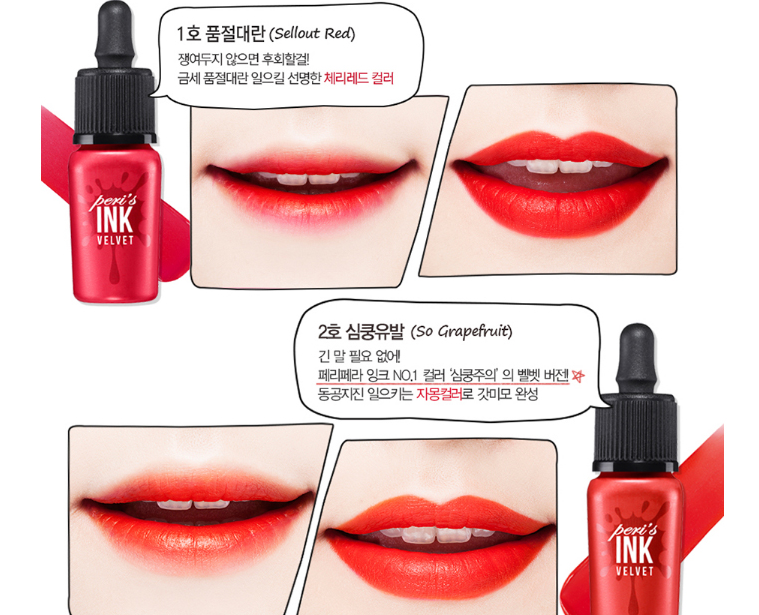 Shade reference, Sellout Red and So Grapefruit. Shade reference, Celeb Deep Rose and Beauty Peak Rose. Finally, there's the Ink Lasting Cushion which comes in two variants - Pink and Lavender. 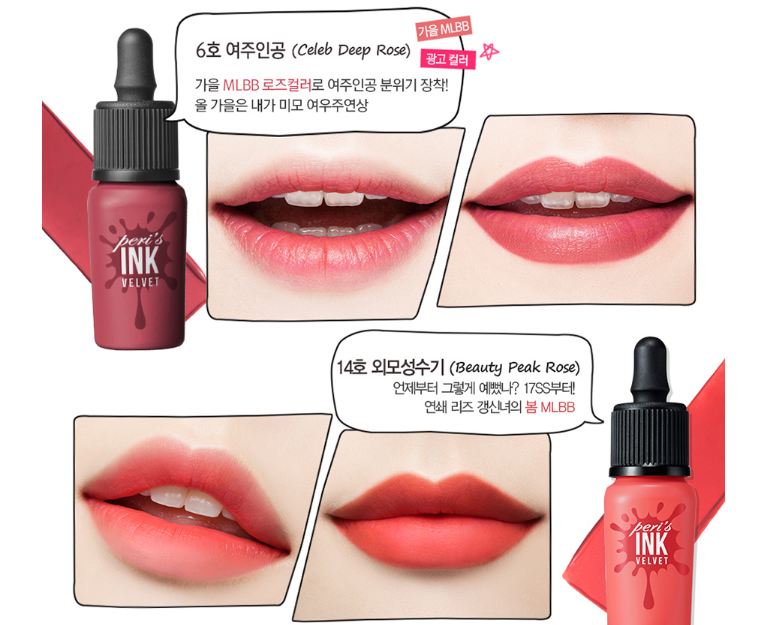 Pearly Night Ink Lasting Pink Cushion, 14000 won. 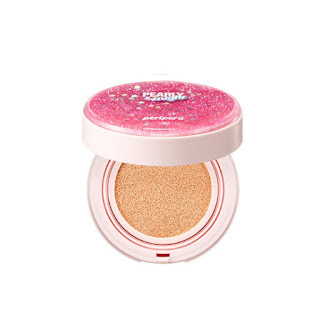 The Pink cushion whitens and brightens the skin and is ideal for those with normal or combination skin. 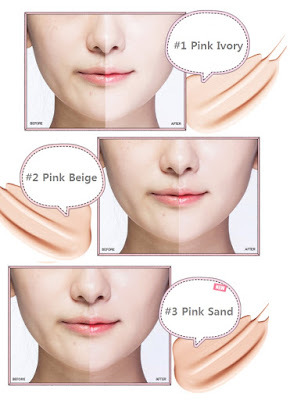 Shade reference for Ink Lasting Pink Cushion. The Lavender, on the other hand, moisturizes the skin and gives it a nice, radiant glow. 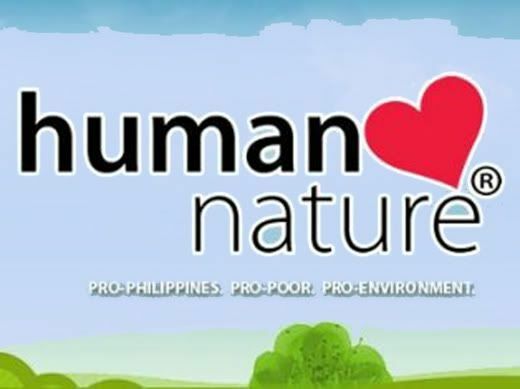 It's ideal for those with dry and dull-looking skin. Pearly Night Ink Lasting Lavender Cushion, 14000 won. Shade reference for Ink Lasting Lavender Cushion. Both cushions feature liquid glitter sparkles which fall like confetti whenever you tilt the cushion case. Lovely, isn't it? The Peripera Pearly Night Collection was officially launched on November 1, and is now available at Peripera stores across South Korea. all products of Pearly Night Collection brand looks stylish . Its worth to use some them this Christmas!! 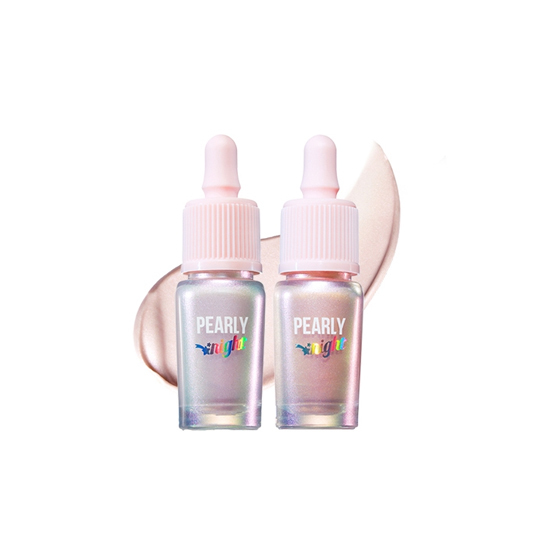 I love pearlescent makeup! Such a fun line! These look like a good product. I will keep my eye out for them. Wow! This products really looks so amazing. I would love to try them out. Peripera Pearly Night Collection sounds amazing indeed. I would love to try everything in this collection. All of the Liquid Glitter Shadows I would love to have and think each color is amazing. Thanks for sharing the information. 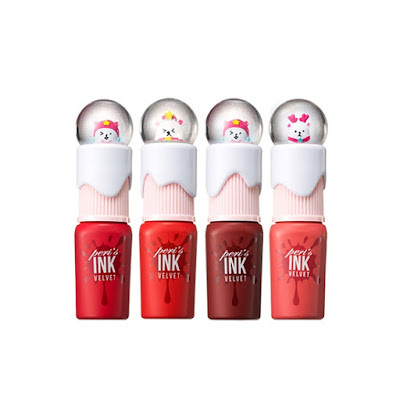 These products look so adorable and amazing. I think all the girls need that collections. The glittery lipgloss is so cute. Teenagers would love this for sure.